Invite Best Mini Kiss Celebrity Look Alike Lookalike Impersonator show to your next event.. A great addition to your party or special event. Great for photos to remember. Mini Kiss celebrity lookalike, look alike impersonators will create a lasting memory. Loads of fun. They might be half the size of the full size Kiss but more than twice as much fun. 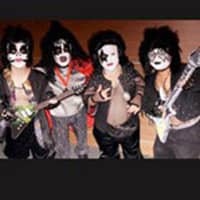 They all love what they do as Mini Kiss Celebrity Look Alike Lookalike Impersonators and put on a great stage show. All your guests will love them as they do their show and then stay around for photos. They have never disappointed and are always the hit of every event they have been invited to. Male a memory that will last a lifetime if not longer and forever with Mini Kiss Impersonators.